The most notorious hike in Coffee Bay is the Hole in the Wall hike. Always a highlight for visitors in the area, the 3 hour hike leads you to a phenomenal rock formation out in the ocean, with well, a hole through the middle where the Mpako River passes through. The roaring sound of the ocean through this hole gives rise to it’s Xhosa name ‘esikhaleni’, place of sound. This hike traverses through running rivers, colorful villages, locals diving for crayfish, and sometimes you can even spot dolphins feeding or whales migrating. 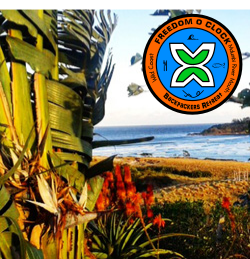 This 9km hike shows you some of the most beautiful landscape the Wild Coast has to offer. The hike does scale up and down mountains so make sure to wear proper shoes, and don’t forget the sunscreen. The hike is also suitable for children, which makes it a great day trip for families. Go for a swim, relax under the trees, and take in the scenery. 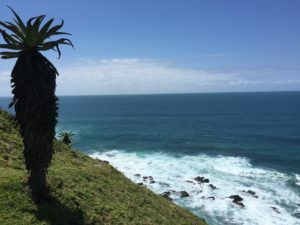 The Wild Coast’s temperate climate makes hiking a year-round joy. The hike can work up quite an appetite, so there is an optional lunch at the Chief’s house for traditional Xhosa food. Afterwards, if you haven’t had enough you can always hike back to Coffee Bay or take a shuttle back to your car.